The U.S. Food and Drug Administration has not yet approved "whole-leaf" or "crude" stevia as a sweetener in foods, according to information on the administration's website. However, certain "refined stevia preparations" such as rebaudioside A can be marketed as stevia by food manufacturers. The FDA indicates this type of stevia falls into the "generally recognized as safe" category. Occasional stomach upset is among the adverse effects of taking stevia. 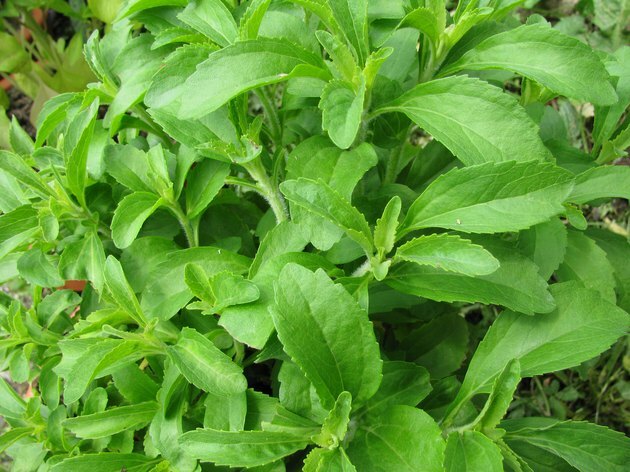 Stevia originates in South America, and the Guarani Indians knew the plant as the "sweet herb" plant because of its intensely sweet properties, according to the book "The Stevia Story" by author Donna Gates. The sweetness of the plant lies in the leaves rather than the stem. Credit for the discovery of the stevia plant goes to botanist Dr. Moises Bertoni, who found the plant growing in Paraguay in 1887. Both Japan and Europe embraced stevia as a healthy alternative to refined white and brown sugars, in contrast the the United States' government reluctance to approve stevia as a sweetener. The U.S. Food and Drug Administration cautions against using unrefined stevia available on the Internet or in health-food stores because of its concerns that stevia can cause difficulty with maintaining steady blood sugar levels, may negatively impact your kidney or cardiovascular functions and has the potential to cause reproductive problems. Consuming the refined version of stevia, rebaudioside A, may cause you to only to experience some nausea or a bloated, full feeling in your abdomen. Memorial Sloan-Kettering Cancer Center lists nausea and abdominal fullness among the reported adverse reactions in patients who consumed about 500 milligrams of "stevioside powder." If you find that your stomach hurts after using large amounts of stevia, reducing how much you consume or avoiding stevia completely will likely relieve your pain or feelings of nausea. Consult your doctor if your stomach continues to hurt after you stop or reduce your stevia intake, because stomach pain may indicate a more serious condition. If you want to continue to use stevia as an alternative to higher calorie refined sugars, try using the FDA approved sweetener rather than unrefined herbal supplements you can purchase in health food stores. Use stevia sparingly, and note whether your stomach hurts after lower levels of intake, or if your stomach only hurts if you consume large amounts of the product. If you are pregnant or breastfeeding, avoid using stevia products unless your doctor or midwife recommends it. U.S. Food and Drug Administration: What Refined Stevia Preparations Have Been Evaluated by FDA to be Used as a Sweetener?